“This is an example of how NFC technology can provide a missing link between the physical and the digital by bringing the best of both worlds together,” says the digital advertising agency. Digital advertising agency Razorfish has developed a 21st century version of the ubiquitous bubble gum machine. 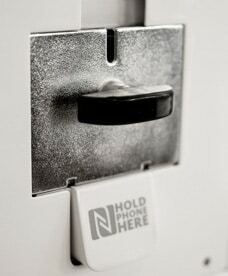 Instead of dispensing bubble gum in return for inserting a coin, the Razorfish concept device, dubbed “Digital Gum Goods”, allows consumers to download digital content to their NFC phone in return for a small payment. The project was developed during a two day prototyping session at Razorfish’s Frankfurt office and makes use of a Samsung Galaxy Tab, an Adafruit NFC Shield reader/writer, a reed switch and two Arduino microcontrollers “all nicely fitted into an original gum machine metal base”. “This is an example of how NFC technology can provide a missing link between the physical and the digital by bringing the best of both worlds together,” says Heiko Schweickhardt, technical director at Razorfish’s Berlin office.